Short update, since it’s been a while. It’s still very busy here. Thomas is still in Norway for a few days every week. I just got back from a weekend of teaching in Switzerland. It was a very nice three day seminar with many fun dogs and handlers. Unfortunately, there was no direct flight and I live 2,5 hours away from nearest major airport, so travelling took one full day (around 12 hours) each way. I’m exhausted! But Squid and I have obedience trials coming up this weekend, so there’s no time to rest. We drove 2 hours (one way) to get some quality indoor training today, and tomorrow we have another indoor training date. Switzerland had interesting distractions. 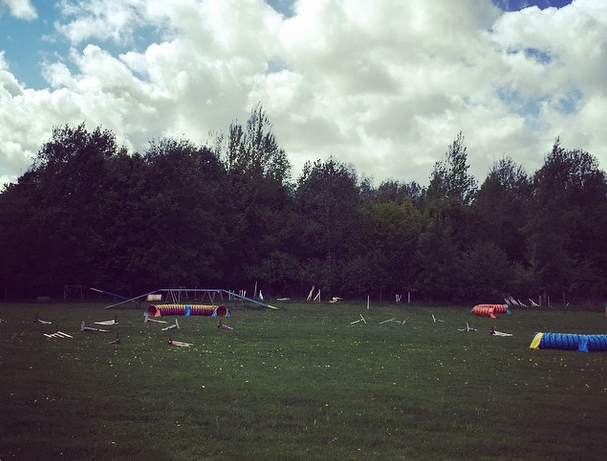 A deer farm surrounding the training field. We really should have trained more regularly this winter, but I was pleased with her performance today. Most parts are really good, but achieving consistency in performance in trials will probably take a lot of effort. Good thing we have many years left. We’ve trained obedience for 6,5 minutes daily on average during the past month. That’s 6 minutes more than our daily average during the three months before that! Our puppies are growing and developing all the time. Leet, 6 months, is with our friend Rebecca to experience some city life. 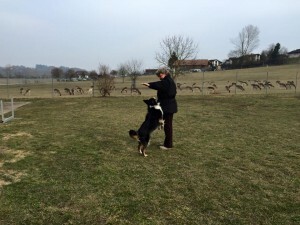 Volt, 5 months, is starting some herding training on a long line and looks really nice! My puppies – Nicks (14 weeks) and Bud (12 weeks today) are mostly just hanging out with us, sleeping, eating, playing and running around on the farm. Just being puppies. They are such nice puppies – very attentive and loves to be close to you. I haven’t had much time to do more that have some short tugging sessions with them. There’s no hurry. They’re having a great time just being puppies, and I think they’ll catch up on the reversed luring and release commands and rear end awareness in no time when I start training them. 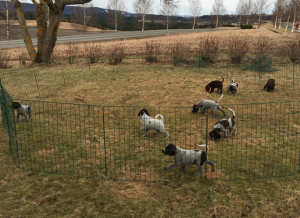 On Friday, Thomas picks up his GWP puppy. The house has been missing something since Paxa tragically passed in January, and now we’re finally getting another bearded lady in the house! 7 week old GWP puppies. I think the puppy closest to the camera is Alot, Thomas’ new puppy.